Although you certainly could never describe life on Wall Street to be quiet and mundane, I'm not sure that it totally translated into a movie. The story was about a relatively novice broker (Charlie Sheen) on Wall Street who worms his way into the life of a unscrupulous multi-millionaire (Michael Douglas) who leads him down the wrong path of Insider Trading. (What's next? A movie about crooked accountants? Crooked Insurance Salesmen?) I just didn't find it very gripping. I can't think of anything specific that made the movie uninteresting, but I wasn't "on the edge of my seat" for any part of this movie. A very average flick. Perhaps, as is my pattern, I'm not a huge fan of movies where you dislike ALL of the characters - this was one of those movies. Maybe I'm a big cheeseball, but it's difficult to warm quickly to stories where even the main character is a "bad guy". It has a star-studded cast, and so the acting was quite well done. Even Bev, who reminded me multiple times how much she hates Charlie Sheen, conceded that he played his role quite well. By the way, Bev thinks Daryl Hannah looks like a man. Hmmm, does this make me gay, 'cuz I'm just not seeing it. 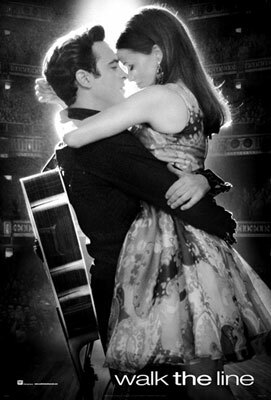 Walk the line certainly show-cases two of the best performances of the year on the screen at the same time. Joaquin Phoenix and Reese Witherspoon deserve all of the accolades they are getting for this one. Phoenix plays the original man-in-black, Johnny Cash, and Reese his long-time wife, June Carter. The film is based on Cash's two autobiographies. It shines a light on the truth behind his life - and follows the story of how he met, wooed, disappointed and ultimately married June Carter, despite the typical rock-star hurdles and a drug overdose and addiction. Unlike Ray - the story of Ray Charles where I was left feeling emotionally unattached to a man who basically continued to ruin himself until the day he died - here I felt a connection and left the theater feeling generally uplifted. It's a good story. Certainly one worth seeing, especially for the theatrical performances. Serial killers movies are generally fun, but this one is mediocre. James Spader plays an X-police detective who, after years of chasing serial killers in L.A., has started to have all kinds of nervous disorders. In an effort to escape his past, he moves to Chicago and begins seeing a psychiatrist (played by Marisa Tomei). Meanwhile, the serial killer (Keanu Reeves) in a case he hadn't cracked enjoyed the cat-and-mouse games that he played with Spader so much that he follows him to Chicago. Unfortunately, that's pretty much the entire movie. Not a lot of plot twists, not a whole lot that's unexpected, and a lot of time early in the movie where the plot didn't seem to be going anywhere at all. Once it gets rolling there is a bit of genuine suspense, but the ending is easy to see coming and results in a cliché fight between protagonist and antagonist. Reeves doesn't play a good serial killer. He just wasn't all that scary - he seemed to have trouble acting menacing. I found him uninteresting in this role. Plus, you don't ever really get to know him or understand anything about why he is so twisted or how he became that way. Tomei's character as psychiatrist is also underdeveloped and serves no real purpose except to become the final victim. All of the write-ups on this movie compared it to the movie "Seven" which is one of my all-time favorite movies. There's no comparison - don't rent this movie. If you want a scary serial killer movie, rent "Seven." We Were Soldiers is "Rated R for sustained sequences of graphic war violence." That's kind of funny because that is also what this movie is in a nutshell. Just a two hour "sustained sequence of graphic war violence." They could've saved on ink on the back of the DVD box by just saying "For movie description, just see the rating below." It's a shame really because the story is actually a good one. It's based on the true story of the colonel who led his troops into the first bloody battle of Vietnam. Unfortunately when it was all over, I can't say I knew much more about the real true story other than the fact that it was a "sustained sequence of graphic war violence." Here's the movie: Pre-war build up of how everyone feels about the possibility of going to war and not coming home. Then, lots of soldiers getting shot and shooting the Vietnamese intermixed with a guy yelling into a phone in the middle of battle. Then, flash over to the U.S. where wives are getting telegrams about their hubbies dying in the line of duty. Then back to lots of guys shooting, lots of guys getting killed. Then back to more telegrams. Then back to more guys shooting, more sustained sequences of graphic war violence. The American troops are overwhelmed, but ultimately they win this first battle as the few remaining enemy run away. Movie ends. Thank me for saving you the $3.95 rental. To prove my point, half way through the movie we accidentally hit one of the buttons on the remote. We didn't realize right away that the button we hit somehow put the DVD backwards about an hour until I said, "Hey, I think we already saw all of this." Did anyone else find the info that preceded each scene to be pointless? Such as "8:45 am, The Knoll," or "1:00 p.m., the Creek Bed." Seriously, they explained NOTHING in this movie. They just kept going from one place in Vietnam to another showing lots of guys getting blown away. If you like watching guys get shot over and over and over and over again, this is your movie. Otherwise, avoid. We rented Wedding Crashers because the movie I was sent to get was not available... What a lucky break that turned out to be! It's certainly not going to win an Oscar, but I couldn't stop laughing while watching this movie. It's also a little longer than it needs to be, but I was sold after the 1st 15 minutes so it didn't matter. If you like Vince Vaughn you need to see this. This role was MADE for him. Definitely worth the rental fee. Maybe it was just a bad night. My husband and I went to see "Baby Boy" -- a movie so bad it doesn't even merit a review, let alone a mention in this review. Be that as it may, after leaving the theater in disbelief that we paid $15.00 for a nap, we decided to rent a movie so the night wouldn't be a total waste. "The Wedding Planner" is soooooo bad, it's almost laughable. It's one of those movies that always seems to be leading up to something, but it never materializes. Not the laughs, not the emotion, not the suspense...NOTHING. Matthew McConaughey can hold his own as an actor -- "A Time to Kill" was one of his better films. Jennifer Lopez is beautiful, which can sometimes help you overlook the fact that she's not really Academy-award winning talent. The movie is predictable, lame, monotonous, sophomoric, moronic and above all, not funny. The supporting cast -- especially the bride-to-be's mother, a drunken has-been -- are all annoying. Jennifer Lopez' assistant acts as if she should up the dosage on her Ritalin. And Matthew and Jennifer sleepwalk through their lines as if thinking, "Man is this a stupid movie -- I need to call my agent." Because I'm feeling charitable, I gave this movie .5 stars because J-Lo is stunning in some scenes. Was it worth $3.00 to see that? Hindsight being 20/20, NO! WOW, very scary. This was an intense blood-curdling heart-pounding haunting-mystery/thriller. It's hard to describe EXACTLY what the movie was about without totally giving away the ending, but let's just say that you will be surprised. Well, maybe not, because my dear friend Binky (see below) says that people described the movie as "predictable", and she goes on to say that the ending was horrible. I totally disagree. Maybe I'm just a big dumb-head. Yes, it was filled with a few of those creepy-movie moments where you go, "OK, why is she going in the bathroom? I would totally be running as fast and as far away from there as I could." However, those moments were appropriate and used to set-up other plot details, in my opinion, designed masterfully. Anyway, Harrison Ford and Michelle Pfeiffer play a middle-aged couple who has moved into an old home in Vermont. Their only daughter moves off to college just as the movie begins leaving the home empty except for Pfeiffer while Ford, a work-a-holic highly-acclaimed genetics scientist and professor, spends most of his time working. In the mean-time Pfeiffer's character is torn between believing she is suffering from "empty nest syndrome" and coming to terms with the meaning of the strange things happening around the house and seemingly tormenting hauntings of a ghost in their home that appears to look exactly like Pfeiffer. Pfeifer must put all the pieces together. The brilliance of this is that the real terror turns out to be the truth itself more than the ghost. What makes this a great movie is the fact that you are sitting on the edge of your seat and ready to jump out of it from nearly the beginning all the way to its chilling conclusion. This movie offers a magnificent blend of true horror and psychological mystery, and if you dare to be scared, by all means, don't wait! When people ask me if I found the movie scary, my answer is not a simple yes or no. My answer is, "I screamed out loud like a little girl - twice. It got to the point where I had to keep my hands over my mouth so I wouldn't scream anymore." When I walked out of the theatre, I could barely walk in my sandals because even my feet were sweating from the suspense. Given all of that information, I must say that the ending was horrible (have you seen the movie "Wolves"?) and some have called the movie predictable, but I enjoyed it. Oh, and Harrison Ford is pretty easy on the eyes, too. Wouldn't kick him out of bed for eating crackers. Please! Chris and Binky -- what are you thinking? Obviously, the scariest thing in your lives has been removing the "Do not remove under penalty of law" tag from a pillow. Jeez. This movie was contrived, painfully deliberate and a waste of a good Hollywood Video free movie coupon. I wasn't scared, I wasn't interested, and I only kept it in the VCR because I was hoping that either Harrison Ford (who I really love) or Michelle Pfeiffer (who I equally admire) would buy the farm so the movie would end. Pfeiffer is a little too Fruit-Loopy in this movie -- too scared to find out the truth and too scared not to find out the truth. Get a grip ... make a decision ... live by your actions. Ford is almost robotic in his lines -- unfeeling to the point of being annoyed. I was waiting for him to say, "I know you're going loony, but -- damn it -- there are genes to be spliced!" Corny special effects, sub-par dialogue, and no character who really evoked any emotion. The only REALLY scary thing about this movie is that three people on Chris' site have seen it. The only thing worse than this movie was "Dr. T and the Women." Not much to say about this movie. It was funny at times, tedious in spots and down right boring in others. But, if you enjoy light-hearted movies this is the flick for you. I had mixed emotions about renting this movie -- never saw the original, loved the song "Ben" by Michael Jackson, not fond of rodents, and have been intrigued by the sheer creepiness of Crispin Glover for years. "Willard" is the main (human) character in the movie. Willard Stiles is the milquetoast son of a deceased father who owned a manufacturing company but was bullied into selling his shares to a corrupt partner, and a mother who is physically and mentally gone. Willard is a loner who is socially and emotionally retarded but is doing his best to maintain a job in the business his father owned and take care of his ailing mother. To add to the misery, his boss takes every opportunity to belittle him in front of co-workers and let him know just how useless he thinks he is. As if the fun at his job and fun at the home he and his mother share isn't enough, Willard finds that his basement is being overcome with rats. What's a freak to do? Hey! How about make friends with the rats and then teach them to destroy and kill! It doesn't take a genius to figure out what happens from there -- it just takes a strong stomach to watch it. The gore factor is kept to a minimum, but the creepy factor is off the charts. Between the bazillion rats and close-ups of Crispin Glover as a man going insane, it's enough to make you sleep with the light on for weeks. Glover is his usual weird self -- he's had the same quirky oddness and facial tics since "The River's Edge." His voice, his face, and his all around strangeness make him believable in a role that isn't all that challenging. All things being equal, this is just a stupid movie about an icky subject, but for Crispin Glover fans, it's a treat to see him back in a role he was born to play. Before seeing this IMAX flick, make sure you take your motion sickness medication. The first few scenes of a puddle jumper flying through the air is enough to make you want to you know what. The movie was 48 minutes in length with 27 minutes spent on native American facts, 13 minutes spent on buffalos, 6 minutes flying on a plane, and 2 minutes on wolves. Did I miss something? I think not. The intention of this movie was to save the wolves, it did nothing to pull at anyone's heart strings to save anything but your 9 clams to go see something else. I had to give it half a star for the beautiful landscapes.